Summer is my season. I used to think it was fall. You know with the crisp breeze and chunky cable knit sweaters? But I’ve grown up a bit, matured, and in so doing have come to realize that I shake like a malnourished Chihuahua when I’m cold and my broad shoulders really bulk up in knitwear. So fall has been replaced by summer, and now I count down the days until I’m lying poolside drinking a margarita. It’s not just the warm weather that does it for me. It’s also the clothes. Nothing makes me giddier than shopping for new dresses or getting to slide my feet unto my broken in gold lamé Birkenstocks. And the food! All of the best produce is in season this time of year, and of course, I run with the other health obsessed, local produce buyers to the farmer’s market every Saturday. The peaches and plumbs and cherries are juicy and sweet, and the watermelon, well it’s my favorite. My mom loves watermelon and so it’s been a staple in our house since forever. For those who don’t know, there’s a sweet spot in a whole watermelon. It’s in the very middle, a cylindrical mass in the center of the watermelon that is the sweetest, most juicy part of the whole fruit. If you cut a watermelon into triangular pieces, the first bite at the top is what you’re looking for. This was the forbidden part of the fruit in my house growing up. Mom would take it for herself before handing over the other, less sweet parts to her offspring. Is this how it works in the wild? Needless to say I’m still tremendously bitter, and every time I’ve bought my own, whole watermelon as an adult, I’ve savored that sweet spot…and maybe uttered a few expletives in my mind. Now that I have more watermelon to myself (no longer forced to share with my hoarding mom), I’ve been able to experiment a bit with the juicy summertime fruit. We’ve established that I love watermelon, we don’t need to establish that every woman worth her salt loves a stiff margarita. I combined the two with this week’s recipe, and present to you, the edible watermelon margarita! It’s sweet, salty, a little bit boozy, and a whole lot refreshing. It’s also super easy to make and will make you the star of your next cookout or poolside gathering. 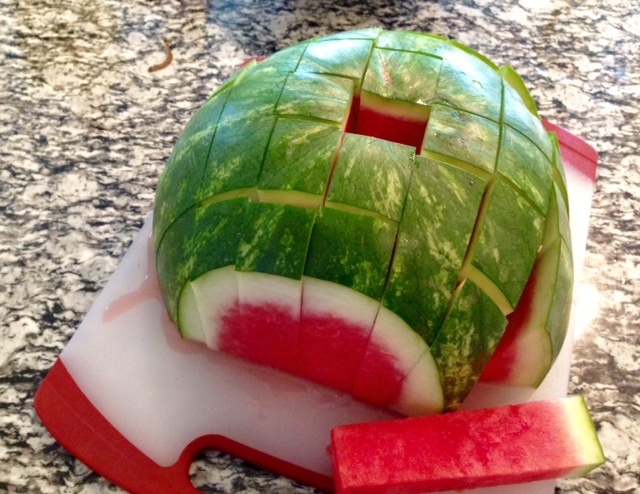 Cut the watermelon in half, width-wise. Lay the watermelon on a cutting board, cut side down. Begin making cuts, about an inch wide across the watermelon. Cut carefully with a sharp knife and beware of your fingers as the watermelon may slip as you’re cutting. Twist the melon 90 degrees and again make cuts an inch wide across the watermelon. You should have 1-1 ½ inch squares at this point. Place the watermelon spears in a single layer in a shallow baking dish and pour the margarita mix and tequila about half way up the pieces of fruit. The amount of margarita mix and tequila will vary depending on the size of the pan, but the ratios will remain the same. 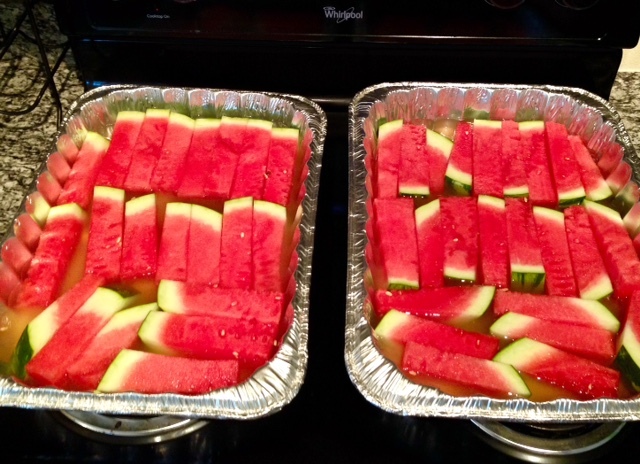 I used the whole watermelon and two disposable aluminum pans which was more than enough for a large party of about 30. I would recommend a half watermelon for a gathering of 10-15 guests. Let the watermelon soak for up to 8 hours, turning half way through. I prefer the fruit to be chilled, but you can let it soak unrefrigerated on the counter if you don’t have space in your fridge. Remove the watermelon from the pans when you’re ready to serve and top with margarita salt. PS: Don’t throw out the mixture you soaked the watermelon in. Just pour over ice and you’ve got yourself a watermelon margarita for the folks who haven’t overdone it with the boozy fruit.